San Francisco is home to many hot shot bakeries we know and love, Mr. Holmes, Vive la Tarte, Tartine....but my new local favorite has got to be Le Marais Bakery in the Castro. To give you the ultimate brunch experience I've partnered with Le Marais Bakery to give ONE lucky winner FREE BRUNCH for two worth up to $50! All you have to do is follow @LeMaraisBakery and me @Savoreachbite on Instagram to enter! The giveaway ends Wednesday, June 27th and the winner will be announced on my story! What I adore most about this location is the big 'Bonjour' tiled floor (so Instagram worthy!) and the accented windows that just pours in bright natural light.. it really just wakes you up! Once you're inside, you'll first notice their pastel colored pastry counter because it is just overflowing with yummy treats! I never know whether I should get pastries first, last?? What's the proper etiquette here? Ok, but the food though! I highly suggest you order one of their 5 for $15 or 7 for $19 breakfast boards, a great way to mix and match simple breakfast items on the menu. You can choose from fresh cut fruit, a croissant, smoked trout, smoked salmon, steel cut oatmeal, the choices can go on! But in true foodie fashion, you know I went in! 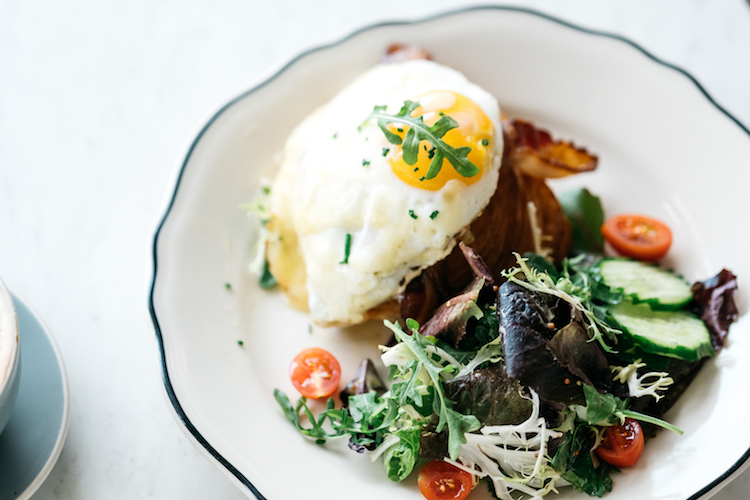 When it comes to brunch, I have the toughest time choosing between savory or sweet, why not both? But one of my absolute favorites from here has got to be the savoyarde, duck with raclette cheese, potatoes, and broccoli. Gooey melty cheese... I'm here for this. * Not pictured, me actually working heh. But seriously, with cocktails, pastries, and wifi.. honestly, what more can a girl ask for?